Change the speed of the music - from 20% (one fifth speed) to 200% (double speed) without changing the pitch. Wrong key? Change the pitch in semi-tones - at full or changed speed. Out of tune? Adjust the pitch in cents (100ths of a semi-tone) to suit your instrument. 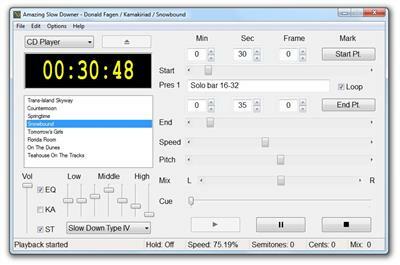 Real-time processing - all described above is done in real-time - just insert the CD and press the play button! Also slows down MP3, Wave, Windows Media Audio, Ogg, FLAC and AAC/M4A files on your computer in real-time. Note: M4P files from the iTunes store is now supported.